Obituary information indicates that services for Captain Snider were held this past weekend in Tomball, Texas. If more information is received we will be sure to update our memorial site. Preceded in death by his parents Dale K Snider and Carol Miedema Snider, his brother Darryl Todd Snider, and his son Patrick Joseph Snider. He is survived by his wife Kelli, son Kevin, daughter Alexandra and her husband Daniel J Anthony, and his beloved granddaughter Kylie Ashlynn Anthony. Brothers Dale K Snider, Jr. (Diana), Terry L Snider (Nancy), Kim A. Snider (Janell), Robin K Snider (Jone), and multiple nieces and nephews. Lifelong buddies, Gerry Reinhardt, Garry Smith, and Ralph Moore. Mark achieved the rank of Eagle Scout at age 13. He graduated from Indiana University with a business degree. Mark had a passion for flying, inherited from his father who was a military pilot as well as a captain for USAir. He was a fighter pilot, flying the F-100 and F-4 for the Indiana National Guard. Mark had a career as a Captain for Delta Airlines where he flew the MD-80, The Boeing 727, 757, 767. His five brothers are also commercial airline captains. 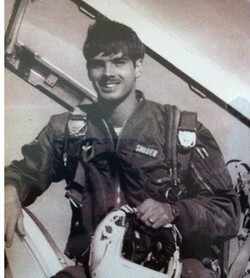 As described by his daughter, he was the All-American Fighter Pilot, extreme sports junkie, extended road trip navigator, spontaneous adventure lover, steadfast partner to his wife, sayer of yes to all things asked of by his granddaughter Kylie, fierce protector of his family, lovable bad influence to his five brothers, their wives, and numerous nieces and nephews. There wasn’t anything he couldn’t fix, build, or accomplish. He was remarkably loyal and trustworthy, and a defier of doctors' predictions. Mark’s incredible wit will be missed by all who knew and loved him. Friends are invited to visit with the family from 6 to 8 p.m. Friday, June 22, at Klein Funeral Home - Tomball, 1400 W. Main, Tomball, TX 77375. Funeral services will be held at 10 a.m. Saturday, June 23, in the funeral home chapel. Interment with military honors will follow at Klein Memorial Park - FM 2920, Tomball.